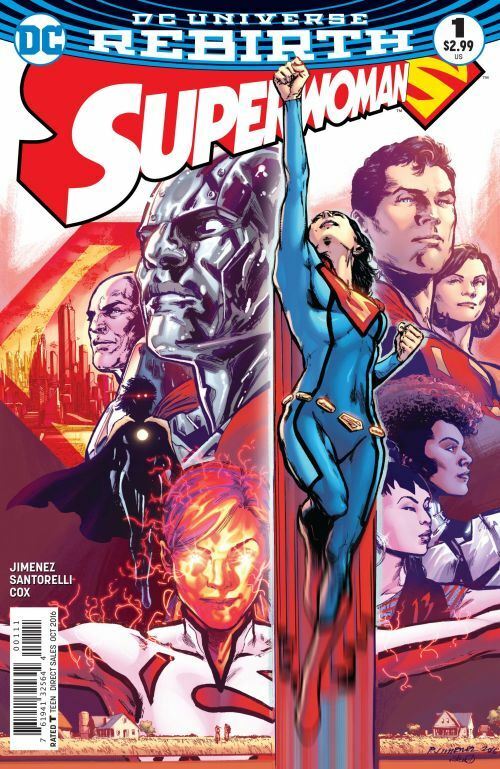 It’s very hard to write a spoiler free review of Superwoman #1. But I am absolutely determined to. This comic is so good it really deserves to be fully appreciated, and its surprises allowed to unfold as Phil Jimenez intended. Perhaps some background would be in order. There have been quite a variety of characters over the years who have used the name Superwoman. Most of them appeared only in single stories, and were not recurring characters. The first who did make comebacks was the villainous Superwoman, the Earth-3 version of Wonder Woman. Shortly before Crisis on Infinite Earths, Kristin Wells travelled from the future to find out the true identity of a mysterious, hooded and masked, Superwoman, and wound up actually becoming her. The visual appearance of this Superwoman was brought back a few years ago, when Lucy Lane got transformed into the last incarnation of the character. While Lucy looked like a Superman Family hero, she was actually a murderous government agent, empowered and controlled by her father. Now, Superwoman is a hero again. Lois Lane is the latest to adopt the title. To be clear, this is not the Lois Lane who is currently being featured in Action Comics and Superman, the mother of Jon Kent. This is the New 52 Lois Lane, the one who publicly exposed his identity as Clark Kent. When the New 52 Superman exploded a power burst while dying, Lois Lane was close enough that she wound up absorbing/inheriting a degree of his powers. Lois may have known Superman was Clark Kent, but she did not have years of close companionship with him, and has no experience honing or using super-powers. So she is forced to turn to Lana Lang for guidance. These two are not as friendly as some pairings of the two main women in Superman’s life, but Lana knows Lois needs some insight, and she is the only one who can provide it. Lex Luthor also plays a role in this debut issue. He is getting increasingly frustrated at the number of new S crests popping up, after trying to take on the role of Superman himself. There are some nice references and allusions in the story, including a paraphrase of the lines uttered in the original Superman film, when Lois gets rescued by the hero for the first time. “You’ve got me? Whose got you?” At times the story evoked memories of the electric Superman, as well as Superman Red/Superman Blue. But that is really about all I can say. Phil Jimenez's art and writing are top notch from beginning to the very shocking end. What’s so shocking? Suffice it to say, the last page of the issue makes one realize that the story you thought you were reading was not at all the story you were actually reading.